Whether playing at the beach, in the sand box or a plastic tub or noodles and rice, sand toys are perfect! My daughter loves baking, cooking and playing in the sand so I was thrilled when I was given the opportunity to receive a variety of Melissa and Doug sand toys. Melissa and Doug have some of the cutest toys in the world! I love the fact that they are fun, unique and durable. They are made with children in mind and are made to hold up to hours of play and abuse. Did you know that Melissa and Doug offer more than 1,000 innovative products for children of all ages? Items include games, pretend play, arts and crafts, trains, dollhouses and so much more! There is something for everyone no matter how young or old they are. 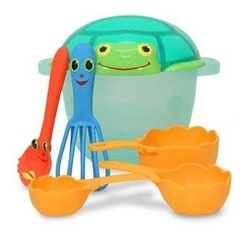 Make fabulous mudpies and sandcakes with this sea-creature inspired "baking" set. Young chefs will love using the shell shaped measuring cups, octopus whisk and crab mixing spoon to "cook" up some great beach treats. The turtle lid on the "mixing" bowl doubles as a sifter! 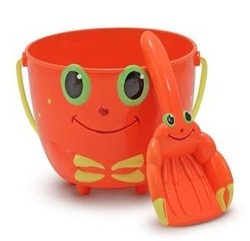 A crab-shaped scoop and a sunny red-orange, crab-face bucket make digging for treasures at the beach even more fun! Clicker Crab is always smiling and you will be too, with this sturdy plastic duo. 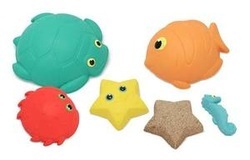 The turtle has lots of friends hiding under its shell: a fish, crab, starfish and a seahorse! This set provides hours of sand molding fun and quick clean up, as all the molds store neatly in their turtle "shell". First, fill the unique , hinged cupcake molder with sand "dough", add cupcake toppers, put in tray and "bake". You can even use the icing tool to add more designs! As soon as I opened our Melissa and Doug sand toys my daughter couldn't wait to get her hands on them. It was pouring down rain so we were stuck playing inside but we didn't let that stop us from having some fun. I put some dinosaur noodles in a plastic tub and she was as happy as a clam! She sat there at the kitchen table and played with her new sand toys for over an hour. The first thing I noticed was just how bright and adorable they were. Just looking at them is enough to put a smile on your face. Don't tell the others this but Clicker Crab is my favorite. The next thing I noticed was just how durable and sturdy they were. The plastic is thick and hard! I can't even begin to count how many sand buckets and sand toys my kids have broken over the years. Most times they are made of poorly made thin and flimsy plastic that snaps after just a few scoops of sand. It's easy to tell that we aren't going to have to worry about broken sand toys this summer and I'm thrilled! We can't wait for the weather here in North Idaho to warm up enough to take our new sand toys on a trip to the lake for some sandy fun in the sun! Visit Melissa and Doug and tell me what other item you'd like to have. A special thanks to Melissa and Doug for this great review and giveaway opportunity! I would also like to have the blue trunki (terrance)! I love all the play food! The Pizza Party is great! I want it all! Okay, I'll pick one. The Blossom Bright Sprinkler. Any of the dollhouses woyld be great!! My daughter saw the Bella Butterfly Bubble Set, and she said "I love that!" I'd like to have the American Presidents floor puzzle. I follow Melissa and Doug on Facebook. I follow Melissa and Doug on Twitter as svberges.